I’ve been pondering on ways to improve the performance of my DB9. Is it better to make changes that add horsepower or to loose weight? The answer is to do both of course, but which will provide more seat of the pants perceptible performance for the least amount of dollars? Which will be easier to accomplish? I set about figuring it out below. One way of ranking two different cars performance is to compute their power to weight ratio. If you think about it, a 4,000 lbs. car with a 400 BHP engine should be just as quick as a 2,000 lbs. car with a 200 BHP engine. Standard – Divide the official Curb Weight (in pounds) by the Engine Power (in brake horsepower) and get a value of lbs per bhp. A lower value is better. Metric – Divide the Engine Power (in horsepower) by the official Curb Weight (in metric tonnes) and get a value of bhp per tonne. A higher value is better. The Curb Weight of a vehicle is the complete weight of the vehicle with all fluids and a 90% full fuel tank. This value does NOT include the weight of passengers or cargo. Do not mix this up with the GVWR. For my 2005 DB9 Coupe I found the Curb Weight by simply looking it up in the Aston Martin DB9 Owners Manual Specifications Section 13.7 about Vehicle Weights. A coupe with an automatic transmission weighs 3,968 pounds (1,800Kgs). A manual coupe is the lightest, and the automatic Volante is the heaviest. There could be a debate about whether horsepower should be measured at the crank (bhp) or actual rear wheel horsepower measured by a dyno that factors out all the mechanical losses getting the power to the road wheels. For this article we are going to use listed engine horsepower as this is readily published by manufacturers. And I know this article isn’t talking about ‘Torque’ either, which is just as valuable a measure as it really relates to that ‘push’ you feel of acceleration. For my DB9 we can also get the power by referring to the Aston Martin DB9 Owners Manual Specification Section 13.2 about Performance. For my year the engine power is rated at 450 bhp. The Koenigsegg One:1 is the first production car to reach the mythical ratio of 1 bhp per Kg. You can see both the base early DB9 and Vantage had better numbers of the base Porsche 911 of the era. 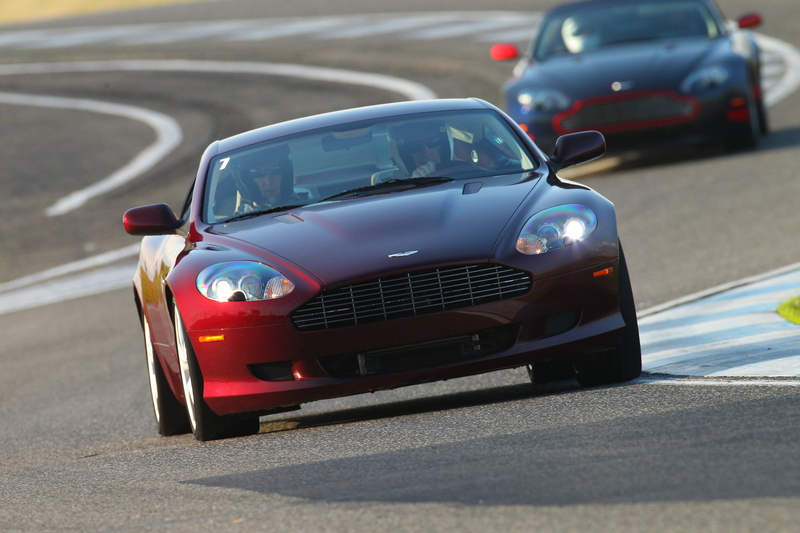 The DB9 had the edge on the Vantage. The later Vantage V12 and DBS were exactly the same. The new DB11 Superleggera is the cream of the Aston crop. What this really tells us that we should all be driving an Ariel Atom if we really want the best value thrills. What’s the Best Way to Improve Performance? At this point I was wondering what would be the best way to improve my DB9’s performance. Find ways to reduce weight? Bolt on some additional performance? Would the options available make a perceivable ‘seat of the pants’ difference (a.k.a. is it worth the effort)? To start with I crunched a few numbers [I gotta be me]. What I really wanted to know was how many pounds of weight loss would be equivalent to adding one horsepower. The current power to weight ratio holds the answer. Reducing the weight by 8.82 pounds produces the same performance gain as adding one horsepower. What weighs about 8 or 9 pounds? What about the running with low fuel? A full tank of fuel in a DB9 is 80 liters. The official curb weight was at a 90% fuel level (72 liters). If we drive with just a quarter tank of fuel (20 liters), that’s 52 liters less. Fuel weighs about 1.7 lbs. per liter. This would be ~88 pounds lighter. That’s equivalent to adding about 10 bhp (460bhp total). So, your car is 2.3% quicker on low fuel vs. a full tank. Probably tough to feel this in the seat of the pants. Get rid of those few extra pounds around your waist. I could stand to loose about 15 pounds, and that would the same as 2 extra bhp. Empty the trunk of your DB9. Hauling around a bunch of crap in the trunk just slows the car down. Adding more horsepower to the engine generally won’t help any of these things. The best possible spot is to reduce un-sprung weight (weight that isn’t supported by the suspension springs). The Brakes, Wheels, Tires and the Suspension components. Reducing weight here helps handling and acceleration. Reducing weight up high helps handling. The higher the position the weight is in a car, the more it acts like a pendulum in cornering and braking [so get a haircut]. We want weight to be as low to the ground as possible. Reducing weight ahead of the front axle or behind the rear axle helps with handling. A lightweight grille, or empty trunk, etc. And what really got me started on this article then was evaluating what performance options would have the most benefit. Here are a few I looked at and the ‘Cost per horsepower’ I worked out. Read on, there is a no-brainer option. Lightweight Battery Kit – the battery in the DB9 is a massive beast (read my article on this). Redpants.lol offers a lightweight battery kit (click here to learn more about it) for about $530 USD that includes a nifty bracket and smaller battery. It claims to reduce the weight by 30 pounds, the equivalent of adding 3.55 bhp. This works out to a about $150 USD per BHP. L ighter Tires – the original tires on the DB9 are Bridgestone Potenzas. 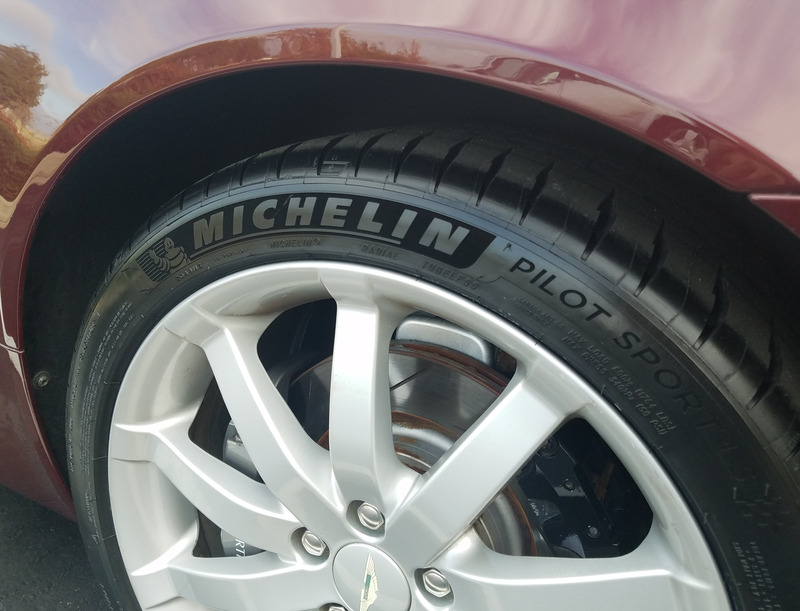 In another article I described alternative tire options, and my tire of choice is the Michelin Pilot Sport 4S. Another upside of these tires is that they weigh about 3 pounds less each than their Bridgestone counterparts. That’s 12 pounds less of coveted un-sprung weight savings, equivalent to about 1.5 hbp. Just make the choice the next time you get tires. High Flow Air Filters – the stock paper element air filters on the DB9 are fairly restrictive for breathing. Velocity AP offers a set of high flow air filters similar to K&N filters that you clean and re-oil when serviced (click here to learn more about it). They claim these will add 7 bhp. Wow! All this for just $120 USD. That works out to be just about $17 USD per BHP. Easy to install during your 2 year annual service. This seems like a no brainer. Secondary Cat Delete – the DB9 has two sets of Catalytic convertors in the exhaust system. These were fitted to meet air emission rules in various countries. The problem is that these cause a restriction in the exhaust flow, choking back some engine performance. Several companies offer a set of replacement exhaust pipes that replace the second set of catalytic convertors, thus improving exhaust flow and engine power. Simple enough install, just unbolt the secondary cats, and install these new straight bits of pipe. Velocity AP offers a solution (click here to learn more about it) for $795 that claims to add 11 bhp while reducing weight by 10 pounds (that’s another 1.2 bhp). That works out to about $65 per BHP. Upgrade the ECU – cars controlled by computers (like the DB9) often have a fairly conservative set of software parameters in them to give the car a nice balance of performance, reliability and fuel economy. People often talk about ‘Chipping’ a car to insert a more aggressive program into the computer. In a DB9 this is actually more simply done by uploading a new software program into the existing ECU. What’s neat about that is that you can have one program for more power, and restore the original program anytime you need to (for MOT or emissions tests, etc.). Several company offer ECU software upgrades. Velocity AP offers one (click here to learn more about it) for $1,395 that include the programming tool. They claim it adds a whopping 25 bhp. That works out to be about $56 per BHP. The package price is $7,695 USD and claims to add 49 bhp total. This would bring you up to nearly 500 bhp total (down to 7.9 lbs per bhp), similar to the DBS. This works out to about $157 per BHP. Getting every last ounce of performance starts to get costly. This list certainly doesn’t describe every performance upgrade out there, and I’d love to hear from you about others you’ve discovered and tried. Please leave me a comment down below and hopefully I can update this article with more options. What am I going to do to Princess Piddles? Probably going to go for the air filters, secondary cat delete and the ECU upgrade. It might be good for about 40 bhp total and I suspect I can feel that in the seat of my pants. Plus I can undo all the changes easily if I want to. If I can get a sweet deal on the full monty I might go for it. If you work for a company that sells performance upgrades and wants me to try one out and write about it, please contact me below by leaving a comment. Whatever I do, I’ll be sure to post articles and videos on it. I expect that I will get my car dyno tested to measure the rear wheel horsepower before and after each upgrade so I can report the data back to you! Aston Martin DB9 Sport Pack Option – Is it Worth it? Great article, I will follow your lead. Steve I read an article about straight pipes and x pipes. The info stated an x pipe will provide more hp than 2 straight pipes as they help to purge each other by way of exiting vacuum whereas straight pipes do not. It would be interesting to know what the better option would be. I see there is an X pipe listed on the FabSpeed site, but I too can be wrong. Interesting article but do we really need to go faster ? Will you notice .5 sec reduced of. The 0/60 time The biggest problem will be comprehending the power l raced cars in my younger years & have noticed my reactions are slower in my later years. My previous car 5 ltr supercharged Jaguar XKR was quicker by .5 sec to 60 than my 2010 Aston but the Aston seems faster due to the way the power comes in . Do we use the existing power we have ? I give it little blast on to the motorway as the car is used most days The other problem you have if you modify the car & don’t inform your insurance company you are not covered Rolls Royce used to quote the power of there cars a adequate the same goes for me with my car. Hi Peter. I agree with you on many points. I believe its already ‘adequate’ to be sure. I’m just a mechanic and car nerd, so curious is the best description. I bet 95% of the time my throttle isn’t even past 20%. But I love that last 5% of the time too. Thanks for sharing! I had FabSpeed put X pipes on my VV and noticed the difference straight away. If you think of an asthma sufferer who takes a massive puff of meds, that’s how my VV seemed to be constantly. The tone is also unbelievable, go to YouTube and type in to listen. Hi Adi. Thanks for sharing that. I’ve been checking out their website some. Looks neat as they have the straight pipe and the X pipe options. I highly recommend wheels and more Inc. for all your performance needs, see link. Thanks Jay, I will check it out. I feel like mines fast enough!, but ive always fancied removing the primary catalysts, i know its a big task, but before BR left pistonheads mike quoted a 30bhp increase, a dramatic fall in engine bay temp, and the end of the misfire induced cat ingestion which destroys the engine in seconds, the secondary cats are perfectly adequate for uk MOT, after removal a reflash is required as the system will see a cat malfunction, lot of spanner work but no real parts spend, what are your thoughts? Hi Craig. I think it sounds very interesting to be sure. I’d probably do it if I had the budget available for one of the header kits like the one from Velocity, etc. I’m curious why two sets of CATS are fitted. What market was it a necessity for? Let me know if you jump in and try it! I dont have the budget either, but got time and tools!!. Hi Craig. Wow, you’ve got to be determined (and a welder) to go that route. Not sure how to tell the ECU to ignore the readings without a specialist programming tool, but maybe a few vendors have those to sell (same as if a header was fitted). Getting the manifolds out looks to be a serious business with so little space. I bet its a witch. If you go for it, please share your experience and a few photos with me. Hi Steve, one general Idea is to find out the differences that the last year production models have compared to older ones. For performance DB9 GT has 560 HP with basically same engine. For weight, DBS has many carbon fibre parts that are fully replaceable. They have been doing little improvements on DB9 for a long time. About the exhaust system Aston Martin used to offer several performance upgrades in their website including a better exhaust system. To be honest, I do not fully agree but the purist Idea is to keep it close to stock or with genuine parts, it is a complete package as is. Thanks for the content here and your YouTube channel. No new videos? Hi James. Thanks for the input on that, I agree with you. Hi Steve, firstly thanks for taking the trouble to post all this really useful stuff on the DB9, some has saved me loads of time! Secondary cat delete on the car is a real benefit. I have a 2005 and used a firm called Quicksilver and there replacements are beautifully made and fit right on. They weigh next to nothing compared with the std cats and no need for any software fiddling as there are no sensors past the primary cats. Noticeable noise increase when pushing on, but ok on tickover. Cabin heat massively reduced too. Give it a go! Hi Peter. Thanks very much for the kudos and feedback. I have a new set of AML Performance Cat deletes sitting here at my desk. Just getting ready to do an article and video on the swap. I’ve heard Quicksilver is good stuff. Thanks for sharing!